I’ve been slacking off on fashion blogging a bit cos I bought a new skybox apartment! I’m really not a skybox dweller, but I really adore Lya Chau’s SweetBox apartment. I also have the Apartment 1.0, which is a more Japanese style apartment. If you’re looking for something fantastic, check out her shop on Marketplace. I stumbled upon this brand on Marketplace, I don’t think there is an in-world presence. This skybox has a living room, kitchen, bedroom, bath, and hallway. It was easy to decorate, I re-used some stuff I had in my inventory already (from past homes) and also purchased a couple of new things. 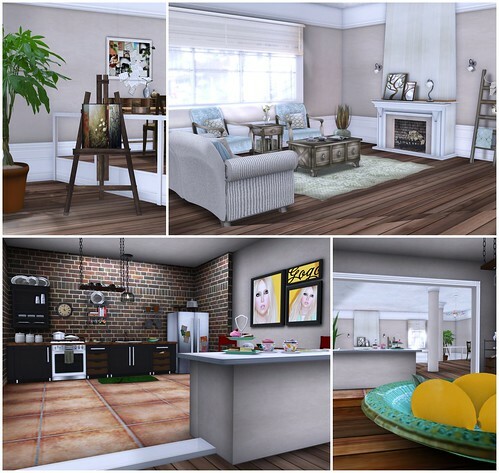 All the furniture and decors are from LISP Bazaar, MudHoney, Nordari, North West, artilleri, and a couple of artwork pieces from Mijn Boa (she’s no longer in SL). I’m almost out of prims, so this is it for now! I’ll probably personalize it a bit more and try to squeeze more stuff in LOL. Your furniture is so much better than in the ad, you really nailed the style here! That skirt is from the ever-excellent League. Oh and could I know where is your hairstyle from? Truth?